James Arlan Steinbauer, age 87, of Owatonna, passed away peacefully Thursday, October 18, 2018 at Koda Living Community in Owatonna where he resided the past three years. James is survived by his long-time fiancé Donna Sellner, Owatonna: his son, John (Paula) Steinbauer, Mankato; his daughters, Kathleen Black, Mankato, and Bernadette (Patrick) Herzog, New Ulm; his sister, Elizabeth “Betty” Kummeth, Goshen, IN and sister-in-law Barbara “Bobbie” (Jones) Steinbauer, Owatonna; 11 grandchildren, 5 great-grandchildren and many nieces and nephews. James was prededed in death by his parents, his brother Richard Steinbauer, and one brother-in-law, Francis “Frank” Kummeth. James Arlan Steinbauer was born June 20, 1931 in LaCrosse, WI to Henry and Georgina (Marcou) Steinbauer. He was a 1949 graduate of Owatonna High School. He served in the US Air Force stateside during the Korean War. After his service, he owned a construction business in Clinton Falls building his home and several houses in Owatonna and the surrounding area. From 1963 to 1993 he worked for Mankato State University enjoying Vikings training camps each year. James was a lifetime member of the Fraternal Order of the Eagles, Knights of Columbus, and the American Legion. He was a proud lifetime member of AMVETS serving in the color guard for many years. He loved creating craft items to surprise and amuse family, friends, medical teams and strangers. 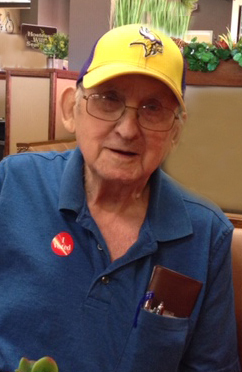 He enjoyed hunting, fishing, and was a lifetime Vikings and Twins fan. Many hours were spent making balsam wood airplanes and puzzles that hung proudly at Koda. He loved his family, grandchildren and great-grandchildren. Many cherished memories of him will forever stay in the hearts and minds of all who knew him. Blessed be these memories.